Greenhouse sceptics argue that the proponents of a human cause of global warming have not made a convincing case. They say we need to understand things better and rule out natural causes before we make costly changes to legislation. This attitude is based on bad science, and the consequences are serious. No one disputes the basic facts. We know from ice cores that CO2 levels are currently 27% higher than at any time for the last 650000 years, or six glacial cycles. We know global temperatures are between 0.4 and 0.8 C higher than 100 years ago. We know from worldwide temperature records going back 150 years that 19 of the 20 warmest years have occurred since 1980, and that four of these occurred in the past seven years. Heat from cities has been ruled out as the cause. 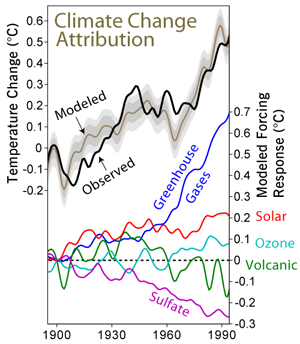 Solar variation and volcanic effects account for 40% of the observed variation, which leaves about half the observed temperature change unexplained except by anthropogenic greenhouse gases. This means global temperatures have risen half a degree Celsius in the last century because of our rate of burning fossil fuels. A few scientists and some thinktanks funded by the fossil fuel industry have allowed the press to portray the situation as a matter of contention, but in fact the only real discussion is about how much the temperature will rise in the future and what we can do about it. Global warming is a scare like global cooling was in the 1970s. Not only is it illogical to argue from unrelated cases, but it’s disingenuous, to use this example, since climate scientists were well aware at the time that there was not sufficient evidence to make predictions of global cooling. The Earth’s climate is within the bounds of natural variation, but environmentalists and others with vested interests are pushing for policy change for their own reasons. This amounts to an ad hominem attack. There are variations including the idea that dissenting climate scientists are afraid to speak out, although actually the opposite seems to be true. The ice sheets in Antarctica are getting thicker. This appears to be misinformation caused by deliberate misquoting of the study. The ice is getting thicker in the middle of the continent because as warming causes the ice around the outside to break off and melt, Antarctica is experiencing increased snowfall in the interior. The “Urban heat island” effect from cities is skewing recent temperature measurements. It has been shown that this has no significant effect on global temperature. No evidence backs the claim that measurements are skewed by the UHI effect; on the contrary, the detail of the UHI effect would make this seem unlikely. Natural changes alone would have caused a marginal global cooling in the past 30 years. There are models of climate which match reasonably closely with observed data – when a greenhouse effect from anthropogenic greenhouse gases is included. It’s a theory with a mechanism which is understood and effects which match predictions. The real debate is about the future, given that even conservative estimates based on no policy response to the issue are likely to be fairly disastrous. In fact the issue seems only to remain seriously open to question in the public mind in the US – the rest of the developed world has long since moved on to finding solutions.